Well, it’s Groundhog’s Day once again and, according to the news, Punxsutawney Phil did not see his shadow today, predicting an early spring in this 125th annual celebration of where a rodent stands in relation to the sun. To celebrate the day, check out our Groundhog’s Day post from last year where we explored the history and science behind the holiday. Keep warm, everyone – spring’s not here quite yet! Now that summer is here, it’s time to get serious about getting out and seeing some sights. If you live in northern Colorado, or are planning on visiting us, we’re excited to announce a new Google Maps-based driving tour that will take you to some of the truly outstanding places in our area. “The Trails of Northern Colorado” is a website created by the Museum as part of a U.S. Park Service Preserve America grant. Literally over 12,000 years in the making, the website offers three different driving tours of the distinctive regions of northern Colorado — the foothills, the river, and the plains. Each tour consists of multiple stops, each with its own unique cultural and natural history story to tell. Taken together, the tour reveals many stories and hidden gems that even long-time residents may not be aware of. I don’t want to give too much more away, other than to say “Go explore!” We really hope you’ll enjoy this great new resource. You can read more about the project on the Museum’s website. ½ plant, ½ animal critter discovered! Sounds like a headline from National Enquirer, doesn’t it? It’s actually a post from msn.com. Scientists have discovered a “sea slug” that can produce chlorophyll. As the slug ages, it also can perform photosynthesis, the process by which plants convert sunlight into energy. This requires chloroplasts, which are tiny cell parts that use chlorophyll. While the slug can make its own chlorophyll, apparently it steals chloroplasts from the algae it eats. Once the slug has consumed enough algae (and therefore chloroplasts) in its life, it can begin photosynthesis. We talk about categorization pretty regularly around here (you got science in my history! You’ve put history in my science! Two great subjects that “taste” great together — name that pop culture reference). It’s fun when new discoveries lead us to rethink our categories. Nothing has changed in the real world — that slug has been there all along — but for us, uncovering these new facts allows us to reevaluate our perceptions, which leads to (hopefully) new understanding and renewed appreciation for the diversity, so much of which is yet unknown, of our universe. Maria Mortati posted a great piece yesterday in the “Museums Now” blog about the process we’re going through to bring science and history together in our new museum. Maria is one of team members at Gyroscope, Inc., the group that’s designing the exhibit experiences that will, I guarantee you, knock people’s socks off when our new museum opens. If you’d like to see some of the very interesting and multi-layered thinking that’s going on as we design this new facility, see “Relevance and Wonder, Science and History” in Museums Now. If you’re keeping up with our blog, you now know that we’ve selected the design/build team which will create the physical home for our new museum. We’ve been working for over a year with our exhibit design firm, Gyroscope, to create the experiences that will reside inside that building. A tremendous amount of work has already gone into the process of creating a brand-new museum from the ground up, and we’ve still got a lot of challenging and exciting work ahead of us. But creating a new museum isn’t about us — it’s about you. You may live in Fort Collins or the surrounding area and plan to visit us often; you may be an out-of-town guest who will come see us infrequently; or you may be someone who visits our website or blog but never steps foot inside the new building. Regardless, this museum is for you. So we want to ask you to help us do some of the work to make this new museum a reality. Specifically, we’d like your thoughts on what we should call ourselves. 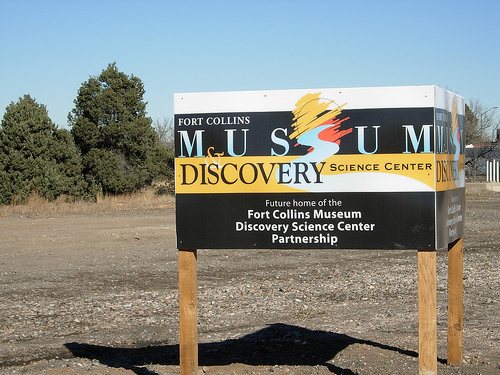 Let me back up for a moment and give you a refresher: the Fort Collins Museum & Discovery Science Center, as we are known now, came from the partnership of two leading Fort Collins institutions: Discovery Science Center, and the Fort Collins Museum. We entered into a public/private partnership to build a new museum, one that would combine hands-on science and the culture and history of our region. Most of all, we want our new Museum to be a place where people not only come away with understanding, but are inspired to action. That’s who we want to be. Now, can you help us figure out what to call ourselves? Just leave a comment to this post with your ideas, and read other people’s ideas too. And stay tuned — developments with the new Museum are really going to take off in 2010. It’s going to be a great journey. The Fort Collins Museum & Discovery Science Center is pleased to announce the selection of Hensel Phelps Construction Company with OZ Architecture as the Design/Build Team for the new Fort Collins Museum & Discovery Science Center facility. Plans for the new facility, located on the corner of Cherry and Mason Streets, include a Digital Dome for presentations, a Learning Lounge, a seamless experience combining science and culture, and plenty of outdoor spaces to take advantage of the prime location along the Poudre River and the bike trail. The project is scheduled to break ground in late 2010. The selection of the architect has been a long-anticipated milestone in the development of our new facility. In 2002, the Museum and Science Center began conversations about how to better serve the Fort Collins and Northern Colorado community. The Partnership was formed, and in 2005 voters approved Ballot Issue 2A, Building on Basics, providing $6 million in tax revenue to partially fund construction and seven years of operations and maintenance of the new facility. This past summer, the Discovery Science Center relocated to the current Museum building, and science and history exhibits were combined as we began developing content and themes for the new facility. The new Museum will focus on the mission to create meaningful opportunities for people of all ages to learn, reflect and have fun through hands-on and collections-based explorations in science and culture. Visitors to the new Museum will experience hands-on science and culture exhibits; artifact exhibits; narrative experiences; play and discovery opportunities; learning lounge, workshops, and archive experiences; guided nature, cultural, and integrated site tours; Science + Culture Cafes, lectures, workshops; archive & collections training; and visitor-contributed exhibits. We hope to break ground in the second half of 2010, with construction completed in late 2011. The Fort Collins Museum & Discovery Science Center plans to hold several public charrettes to collect input about the new facility. For more information about the project or how you can help, please call Annette Geiselman or Cheryl Donaldson at the Fort Collins Museum & Discovery Science Center, (970) 221-6738. We’re very excited to be working with the Anthropology Department at Colorado State University on a collaborative project to delve deeper into the information we have here at the Museum about historical and contemporary Native American life in this area. This fall, students in Dr. Kathy Pickering’s Indians of North America class are engaging in research projects to find new information or reinterpret the existing information we have in our collections and interpretive programs. The projects they develop will help us in creating future exhibits and programs for the community. This project was the brainchild of CSU’s Dr. Pickering and the Museum’s Dr. Brenda Martin, with research support being provided primarily by Linda Moore, Curator of Collections, Lesley Drayton, Curator of the Local History Archive, and Katie Bowell, Curator of Cultural Interpretation. The students are working with ethnographic, archaeological, and historical data in relation to the Native Americans that lived and still do live in Fort Collins and surrounding areas. The culmination of their work will be a presentation of their findings to Museum staff, members of the Department of Anthropology, the local media, and the public on Monday, November 16th, 2009 from 1:00 pm – 2:00 pm in the Lory Student Center in room 213-215. We plan to make selected student projects available on the Museum website after the end of the semester.